Juan Hernandez Navarrete stopped Nawaphon Kaikanha in round three Saturday night at the National Stadium Gymnasium in Kaikahna’s hometown of Bangkok, Thailand. With the win, Navarrete captured the vacant WBC flyweight title and improves to 34-2 (with 25 knockouts). Kaikanha suffers his first loss as a pro and falls to 36-1 (28 KOs). Navarrete, who hails from Mexico City, and Kaikanha vied for the WBC title that Roman “Chocolatito” Gonzalez vacated in late September after winning the WBC junior bantamweight title from Carlos Cuadras on Sept. 10. The WBC ordered the fight between the highest-ranked contenders, which were Kaikanha (the mandatory challenger) and Navarrete, who was ranked number two. Entering the fight, Kaikanha was ranked No. 7 by THE RING magazine. From the opening bell, Kaikanha pressed the action as Navarrete moved side-to-side around the ring. Kaikanha’s tactic almost paid off a minute into round two, as a right hand seemed to momentarily stun Navarrete. Kaikanha continued to walk Navarrete down, but ran into trouble midway through round three when he was hurt by an uppercut from Navarrete. Kaikanha stumbled backwards against the ropes where Navarrete unleashed a barrage of punches, finally putting the Thai fighter down with a sweeping left hook. After Kaikanha beat the count, Navarrete went in for the kill, landing a barrage of punches against a defenseless Kaikanha in a corner, prompting American referee Thomas Taylor to intervene and stop the bout at 2:29. Kaikanha’s older brother, former WBC junior bantamweight titleholder Suriyan Kaikanha (49-7-1, 25 KOs), had better luck Saturday night, knocking out Tommy Seran (28-14, 16 KOs) at 2:31 of the third round. You can subscribe to the print and digital editions of THE RING magazine by clicking the banner or here. You can also order the current issue, which is on newsstands, or back issues from our subscribe page. 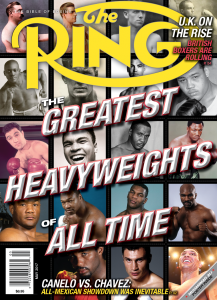 On the cover this month: THE RING reveals The Greatest Heavyweight of All Time.